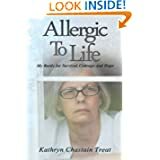 This entry was posted in Allergic to Life: My Battle for Survival, Allergies and Sensitivities, Chronic Illness and Treatment, Courage and Hope, Environmental Illness, Mold Exposure, Multiple Chemical Sensitivity and tagged Allergic to Life Giveaway, and hope, And The Winners Are!, courage, e-book giveaway, environmental illness, Goodreads Giveaway, Rave Reviews Book Club, survival. Bookmark the permalink. Wow. I can’t remember the last time I won something. Most Exciting. 😀 Thanks. Colleen, I sent you an email to see what format you wanted Kindle or Nook. You can reply here as well. Wow! Great number of entrants, which generates interest in your book. Congratulations!